We are open Monday through Friday, 8am to 5pm; With the exception of Holidays. How do I release my vehicle to my insurance company? In order to release your vehicle we must have it in writing (no verbal releases). a) You can call the office to request us to fax you a release form and fax it back completely filled out. b) Download the release form from the link at the bottom of the page and fax it back completely filled out. c) Come in to the office and fill out the release form here during normal business hours. 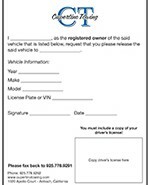 How do I get my personal property from my vehicle? If no police department release is required, the registered owner of the vehicle may retrieve personal property. Items that are bolted or wired to the vehicle however cannot be removed. If I have AAA Roadside Service, can I call you directly for service? Unfortunately you can not. You must call the Emergency Road Side number 1-800-AAA-HELP /800-222-4357. What do I do if I can’t afford to get my vehicle out of your storage yard? You can come into the office during normal business hours with the title to the vehicle and your ID. The fees will stop accruing on the date you turn over the title, but you will still be responsible for the fees up to that date. May I set up an appointmet for service? If you are a AAA member, you must contact AAA first. If you are not a AAA member, you may set up an appointment for service by contacting us at (925) 778-9292. Do you sell cars or have vehicle auctions? We try to have auctions every 1st & 3rd Wednesday of the month, if there are cars. You can either follow us on Twitter for updates or call ahead to see if the auctions will be held that week. Can I pick up my vehicle after normal business hours? Yes you can, but there we be an additional fee. Please call ahead for amount.